Whirlpool (WHR) on Thursday cut its 2010 earnings outlook to a range of $7.80 to $8.30 a share as a result of a plea agreement of its indirect subsidiary Embraco North America Inc. in a price-fixing case. 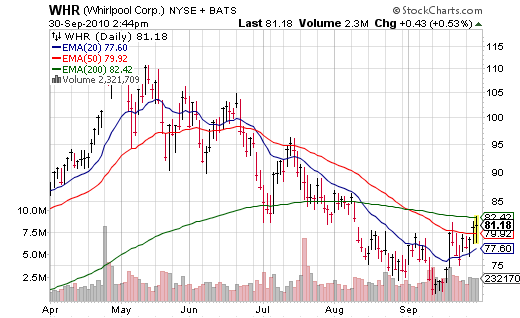 Whirlpool had previously forecast full-year earnings of $9.00 to $9.50 a share. The appliance maker will also record a $1.20 a share expense in the third quarter due to the plea agreement. The Department of Justice said earlier Thursday that Embraco will plead guilty for conspiring to fix the prices of refrigerant compressors and pay a fine of $91.8 million. Apparently reducing your profits by $0.70 to $1.70 is only worth a loss of 20 cents to a stock nowadays…. was I teleported to 1999 somehow a month ago? Ricky Martin and Backstreet Boys are not on the radio so I still seem to be in 2010… hmmm. I do understand this is not an operational issue and hence a 1 time hit but cmon people, let’s get a little depressed and sell some stock ;) Or at least this one. The stock made me sweat profusely yesterday as it finally broke over the 50 day moving average which was its ceiling for the previous 3 days. Thankfully I still had the 200 day moving average as a backup resistance level, but I thought that would be useless on this morning’s gap up and run in the broader index. But it serves nicely as a stopping post, as my stop loss was just above it and missed by about 20 cents. Someone congratulated me on the timing of the short in comments, but frankly any random news events have little to do with skill – just plain luck. That goes to the downside or upside – you own enough stocks, and you will get hit with “out of the blue” news eventually. Same goes if you bet on a 50/50 proposition of an earnings release… little to congratulate anyone on as they simply put their chips on black or red and crossed their fingers. Bigger picture I am still down 3% on the position from my averaged cost as the market that takes no prisoners (to the bears) continues to pummel. But -3% in the past month on any short position is considered “winning”.